Kouhei Hasekura is a sophomore who transfers into a prestigious public school—an English style six-year school, serving junior high and high school students. The school, named Shuchikan Academy, is on an island, Tamatsu Island, off-shore from mainland Japan, and the only way to get there is by boat. But under the peaceful surface, this prestigious academy holds a dark secret. Some of its students are vampires! And Kouhei will be dragged deeper and deeper into the mystery of the school and the girls that attend. Well the story is uh yea. as for me it IS interesting. I still haven't watched so I really don't know, though I have already read its manga. Well its a story of a boy who just transferred to a school at his hometown. He transfers every time due to his fathers work. especially the student council. Well the boy found out that the president and the vice-pres of the student council are vampires. he tends to help the vice-pres who is on agony due to blood-thirst and as the series goes on, the two develops their for each other. Well I found this so COMMON. I mean, one helps the other then develops their feeling for each other. But as for me, THAT kind of story never gets old to me. It's just so cute! Hell yah! Thats 10 points for you! I only see the main as charming. I enjoy this manga. I love manga that has romance! Fortune Arterial feels like every other manga with a visual novel out there. Whereby it pieces together a decent narrative that cannot possibly satisfy all the fans of the visual novel and this is further marred by having the most bland artwork imaginable. Nevertheless it is a generally sweet manga, or that's how it first comes across; as Kouhei Hasekura transfers to a prestigious boarding school, situated on an Island off-shore from Japan. Though this isn't his first time, as he has transferred schools multiple times, due to his father's work and is hoping this will be the last. And there we have our manga, that at first appears to be about as original as modern vampires basking in sunlight, but then the story actually gets somewhat interesting. Oh yeah, forgot to mention, this story involves vampires. Which honestly this manga does a good job masking, as we initially follow Kouhei getting used to the school, making new friends and working with the Student Council he's coerced into joining. Then it is the sudden shift in tone which makes this title quite jarring to follow. Where characters that seemed rather light-hearted at first, are given some pretty heavy back-story. And it's up to not only us the reader, but also the main character, to adapt and wrap his head around. But the main character in question is one I hold no strong emotions for. Kouhei does start off like every other male protagonist I tend to despise, monologuing how painfully average he is within the first couple pages. Yet he eventually grows as a character, thus cancelling out my earlier disdain into a rather muted feeling. Then we have our generic female protagonist Erika Sendou, who happens to hold some awkward feelings for our male protagonist. It isn't until her ancestry is revealed that things are explained and she becomes an interesting character in the process; with a greater sense of depth and a broader range of emotions, those chapters provided. I found her and her supposed rival (Kiriha Kuze) to be the more interesting characters of the lot, however readers may hold a different opinion. Now one opinion that I feel strongly about is the artwork of Fortune Arterial and how it brings down the overall quality of the work. The problem is that the art style is so generic and rudimentary that it simply does not fully portray the type of manga this is. It doesn't even work to juxtapose the contrast, between the upbeat day-to-day aspect, with the more darker vampiric aspect. The artwork simply is bland and boring. 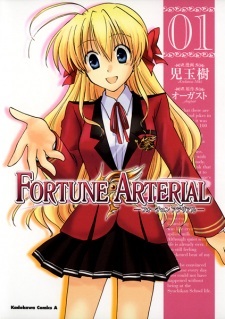 Overall Fortune Arterial is a manga that gives the readers the impression they are about to read a simple light-hearted high school romance. But they will sink their teeth into it, only to find a dark and bloody tale buried within and honestly... I liked that about it. Though the transition felt somewhat jarring, the change in the story is what held my interest. It's a shame that the mediocre artwork couldn't change along with it. And this isn't helped that after all the tension, anguish and drama the story builds up, it all just resolves quite easily and smoothly. A bit too smooth for my liking. This story about High School vampires manages to be both funny and insightful. I watched the anime some time ago. After reading this I'm impressed how much better the manga is. The story is enjoyable, well paced, and ends on a satisfying note complete with "happily ever after" extended coda. A romcom aspect is present but plays second fiddle to meaningful and insightful issues. Secondary characters are one dimensional, but with so much page time given to fleshing out the main cast it's forgivable. Artwork isn't amazing, but sufficient to the task. It shows what happens where quite nicely. My final take? This series starts with a good story. Nothing is spectacular, but with such a solid foundation it doesn't need to be. I enjoyed this series very much. It wrapped up nicely, but if there were a sequel I'd definitely check it out.